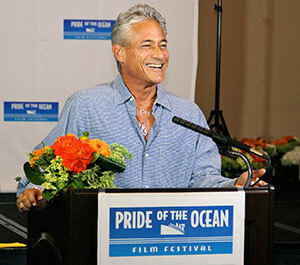 Seattle, WA: Olympic legend Greg Louganis appeared in Seattle for the launch of the Pride of the Ocean LGBT Film Festival cruise, featuring scenes from the upcoming documentary on his return to the world of diving – BACK ON BOARD. While speaking, he responded to questions on the controversy of the Winter Olympics scheduled for Sochi, Russia. The director of BACK ON BOARD, Cheryl Furjanic, will be one of the filmmakers aboard the film festival cruise, departing Seattle for Glacier Bay, Alaska, and hosting workshops, seminars, and films along the way. Addressing the press, Louganis spoke to how the documentary came about. “Cheryl reached out to me after she saw a New York Times article about me making my way back to diving, and coaching a dive teams.” The film, begun two years ago, chronicles the changes in Louganis’ life that brought him into his current role of mentoring in the sport he dominated for so long. 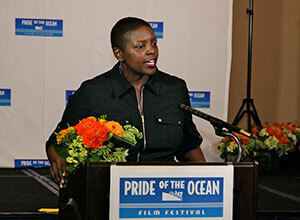 Following Louganis’ remarks, John Scagliotti, Emmy Award-winning director of the documentary BEFORE STONEWALL and Programmer of the Pride of the Ocean Film Festival, introduced the other speakers, including award-winning filmmaker Yoruba Richen, and celebrated LGBT community advocate and filmmaker Andrea Meyerson, recipient of this year’s Body of Work Award. James Pollin, Cruise Director of the Pride of the Ocean cruises and owner of the Pollin Group, unveiled the 2014 fifth anniversary Pride of the Ocean cruise, leaving New York on June 1 and sailing for Bermuda on Norwegian Cruise Line’s brand new ship, the Breakaway. For more information about Pride of the Ocean, visit www.prideoftheocean.com. Can't decide? View our Pride of the Ocean Cruise lineup! Click to See All Our Cruises! Copyright © 2019 Pride of the Ocean. All rights reserved.